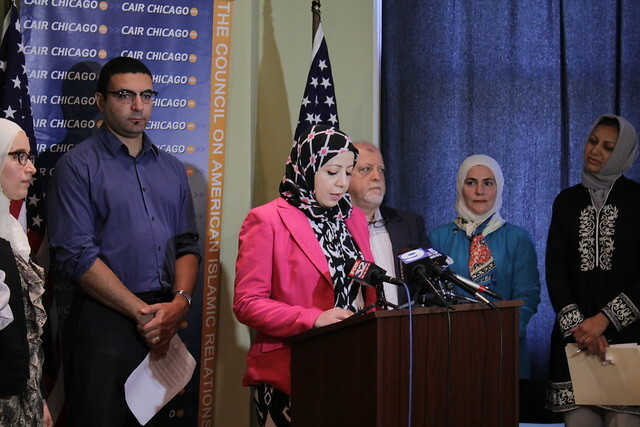 On Thursday, September 17, local organizations joined CAIR-Chicago to hold a press conference demanding action on the growing Syrian crisis. The message of the press conference was “Chicago Welcomes Refugee.” In their statements representatives from various organizations were united in their call for the United States to take in at least 100,000 Syrian refugees out of a total of 200,000 refugees from around the world. In addition to refugee relocation, the group called for the enforcement of a No Fly Zone to stop Dictator Bashar al-Assad’s regime from bombing civilians, which ultimately fuels the destruction of families and humanitarian strife at the root of the refugee crisis. The organization that showed their support along with CAIR-Chicago were the Syrian American Medical Society (SAMS), Syrian Community Network (SNC), Syrian Forum USA, Syrian American Council (SAC), CIOGC, RefugeeONE, and Syrian Christians for Peace. Several Syrian refugee families living in Chicago were also in attendance. CAIR-Chicago asks the public to continue to pressure local and national government to take action by remind them that the American people want to support these refugees. Use the hashtag #Chi4Refugees to share the message that Chicago and its people support the Syrian people and that the city of big shoulders is ready to share in confronting this global crisis. If you are interested in aiding refugees that have migrated to Chicago, the following is a list of organizations with volunteer opportunities: Refugee One, World Relief Chicago, Heartland Alliance and its partner Refugee and Immigrant Services (RICS), and Girl Forward. You can also check out this list of 80+ volunteer opportunities at voluntermatch.org.